North Korea’s latest ballistic-missile test Wednesday appeared calculated to avoid crossing red lines that could provoke military action by Washington, while demonstrating an advance in its campaign to build nuclear weapons capable of striking the United States. Pyongyang said the test of its longest-range missile yet showed it could target the entire U.S., as the WSJ’s Andrew Jeong and Jonathan Cheng report. Meanwhile, President Trump pledged a new wave of major sanctions on North Korea after his call with China’s Xi Jingping, as the Washington Post’s Simon Denyer reports. Dive Deeper: See the Washington Post’s excellent interactive article, “If North Korea fires a nuclear missile at us, how would we try to stop it?,” which was aided by CSIS’s Tom Karako and the CSIS Missile Threat Project. Also, see David Albright’s excellent slide presentation on North Korea’s nuclear capabilities. Ahead of a key OPEC meeting, there are signs the Saudi-Russia partnership is under strain. The fragile alliance between the world’s two largest crude oil producers faces its first big test, with Saudi Arabia still waiting on a clear commitment from Russia to back an extension of output cuts throughout 2018. The two oil superpowers, which came together last year to reverse tumbling oil prices, have appeared unable to finalize a deal in the run-up to OPEC’s meeting on Thursday, which brings together countries both inside and outside the cartel that together pump over half the world’s crude, as the FT’s David Sheppard and Anjli Raval report. Dive Deeper: See the new CSIS report, Energy and Development: Providing Access and Growth. In a bid to unblock the Brexit negotiations ahead of the European Council meeting in Brussels next month, the United Kingdom has dramatically expanded the scope of what it is formally willing to pay in ongoing financial commitments, a senior government minister familiar with the negotiations confirmed Wednesday, as Politico Europe reports. Dive Deeper: See the Chatham House study, The Future of Europe: Comparing Public and Elite Attitudes. North Korea has launched 20 missile tests in 2017; 15 were successful. Source: James Martin Center for Nonproliferation Studies. — President Trump on Pyongyang’s latest missile launch. 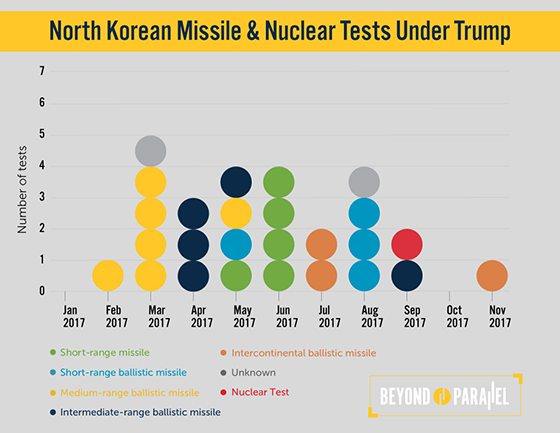 This graph from Beyond Parallel shows the number of North Korean missile tests conducted since that start of the Trump administration. If the current rate of testing continues, North Korea will have carried out more missile and nuclear tests during the Trump presidency than any previous U.S. presidential term. (Photo credit: Ed Jones/AFP/Getty Images.) 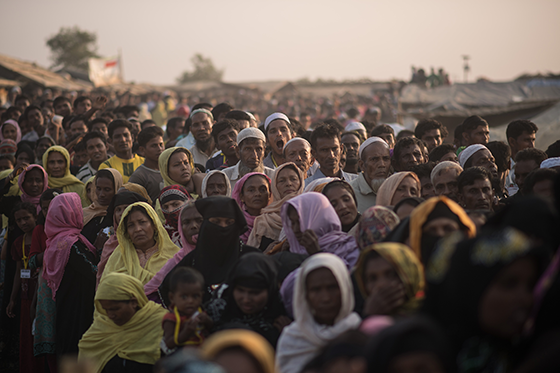 Rohingya Muslim refugees wait in line to receive rice, water, and cooking oil in a relief center at the Kutupalong refugee camp in Cox’s Bazar, Bangladesh, on November 29, 2017. At 10:00 a.m., join CSIS’s Africa Program for “Confronting the Problem of Fake News in Africa,” featuring case studies from Kenya and South Africa. Join the Wilson Center at 9:00 a.m. for a conference on Russia and North Korean nuclear weapons, with a focus on the implications of Russian-North Korean relations for U.S. policy. Last month, CSIS hosted Kenyan opposition leader Raila Odinga for a discussion on advancing democracy, rule of law, and stability in the country. This week CogitAsia takes a deep dive into the outcomes of China’s 19th Party Congress. Following President Xi Jinping’s resounding success during the recent party summit, two leading experts on China joined the podcast to analyze the implications for China’s economic planning, foreign policy, anticorruption effort, and censorship. Listen on Apple Podcasts or SoundCloud. George Harrison passed away sixteen years ago today but his music lives on. Thanks to all who have been writing to me about Harrison this week—I’ve really enjoyed discussing one of my all-time favorite artists. Harrison wrote some of his greatest and most memorable songs as a member of the Beatles. “Something,” “While My Guitar Gently Weeps,” “Here Comes The Sun” and “Taxman” are some of the most popular tunes ever recorded. I checked Spotify, the streaming service of record today and “Here Comes The Sun” ranks as the Beatles most popular song. As we’ve been discussing this week, some of Harrison’s post-Beatles music is just as powerful. “My Sweet Lord” is a truly sublime song. And for me, it’s power grows and grows as the years go by.